There was a moment in Disney Infinity where we realised what developer Avalanche was trying to do with its game. It happened after we plopped the plastic figurine of Captain Jack Sparrow onto the Disney Infinity hub and headed into his Pirates of The Caribbean adventure – one of three available to us. After the opening few moments during which we fought off evil pirates from Davy Jones's crew and rescued Mr Gibbs from a prison cell, the game rewarded us with our own ship. It proceeded to play a short intro about what the ship could do, what it looked like, how many guns it had and how big it was. We watched it all enrapt with only a single thought on our minds: “We can't wait to play with that!” We were suddenly four-years-old again, completely swept away with the prospect of playing with a brand new toy. 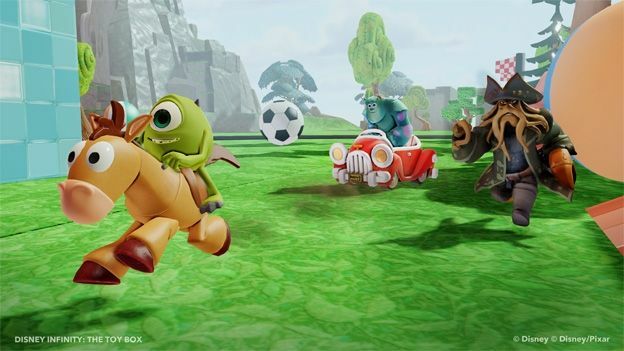 It's this childlike excitement that developer Avalanche wants to recreate with Disney Infinity. Sure, on the surface, its game may look like a late-comer to the toy-peripheral game market currently enjoyed by Skylanders. Like Activision's game, Disney Infinity's starter pack comes with a copy of the game, three figuerines - Captain Jack Sparrow, Sulley and Mr Incredible - and a hub peripheral. And yes, if you place a figurine on the base that character instantly appears on screen in the game. But Disney Infinity wants to create something that stands apart from the fairly linear experience Activision's title offers. The game wants you to unlock as many toys as you can, and then enjoy them in a huge open-ended creation mode called Toy Box. Toy Box is essentially a huge 3D level designer along the same lines as the level creator offered in Little Big Planet. In it, players can select from a vast array of toys, components – such as race tracks, ramps, beach balls, cannon, spawn points and more – and pre-built sets and create… well… anything they fancy, really. You can construct a race track made out of conveyer belts that have basketballs endlessly dropping out of the sky on it. You can build stunt tracks complete with ramps and hoops of fire. You can even chase your friends around on the map on a pair of Recognizers from Tron, firing loo-rolls at each other from specially constructed guns. You're really only limited by your imagination and the time you have to spend on crafting these huge amusement parks. Trust us when we say that you – and a family member or mate – can lose hours of your life trundling about in Toy Box mode. The other main mode in Disney Infinity is Play Sets, which are the closest the game comes to offering a campaign. They're based around the universes of the characters that come with the Disney Infinity starter pack – The Incredibles, Monsters Inc and Pirates Of The Caribbean – and their main function is to familiarise players with the game's controls and allow them to unlock content for the Toy Box mode. The Play Set adventures for Captain Jack Sparrow and Mr Incredible are brawlers while the campaign for Sulley from Monsters Inc involves pranking a rival university to Monsters University. They're all relatively short, rather straight-forward and seasoned players won't really find them challenging or compelling. Still, they're rambunctious fun – especially when played with a friend. And here's where the first catch comes in; it's not possible to use all characters across all the different Play Sets in local co-op. You can't, for example, join Mr Incredible in his adventure with Captain Jack Sparrow. Since the three characters that arrive with the start pack are all from different universes, in order to play in local co-op, players will need to purchase an extra figurine. The Play Sets also lock off content that can only be opened by adding new characters to the mix. Extra figurines start at £15 a pop. You can also buy extra Play Sets from The Lone Range and Cars movies for £35 each. It's quite a sizable amount to spend on a game that costs nearly 50 quid to start with. So Disney Infinity may end up being a bit of a costly affair – especially to those players who have children. But then, if you're prepared to shoulder the cost, Disney Infinity is arguably this year's strongest family-oriented title. The Play Sets may provide players – young and old – with a brief distraction, but Toy Box will prove nearly as addictive as playing with toys in real life. Disney Infinity's power is that it recreates in adults the wide-eyed sense of fun they had simply playing with toys as children and, as for their kids, well… they're there already.